The more technology advances, the more it seeps into our daily lives through areas we may not expect. When the first automatic garage door was created, i.e. when the first electric opener was invented, the practicality of the mechanism wasn't as sound as it is today. Now modern garage door opener models have all sorts of unique features to offer you, as well as massive enhancements to the security and safety of your home. Not to mention, the sheer convenience they afford. An automatic garage door can add a great sense of security to any home. We all know that a classic door can be easily broken into by thieves, especially when we forget to lock it. The main advantage of an electric garage door opener is that it cannot be activated without a remote control. That used to be quite literal, but today many brands like LiftMaster, Genie, and Amarr offer homeowners the option of using their own smartphone to open and close their garage door. Thanks to the photoelectric sensors that modern garage door opener models use, user safety is maximized as well. These safety sensors are installed on each side of the bottom parts of the door's opening, usually attached to the lower ends of the vertical tracks. They send an invisible between each other and alert the opener each time that beam is interrupted. This lets the opener know if something is blocking the door's path and forces it to reverse it's movement accordingly, in order to keep from hitting that person or object. Another advantage is represented by the lifetime that modern garage door models boast. As long as it's properly maintained, such a system can work properly for well over a decade, as the opener's various features will prevent it from taking needless damages and reduce the operational wear and tear through a more efficient operation. Furthermore, more and more companies use high-quality materials such as steel, wood, and even fiberglass. Different materials offer different levels of insulation and durability, as well as curb appeal and maintenance requirements. Unlike with a manual garage door, where the user has to provide a certain amount of input in order for the panels to move (i.e. raise and lower the door) an opener makes the system completely automatic, which means even a child could open it easily by clicking a button. Furthermore, you won't have to exit your car to open or close the door, which can be a great comfort if it's pouring rain or sweltering hot outside. 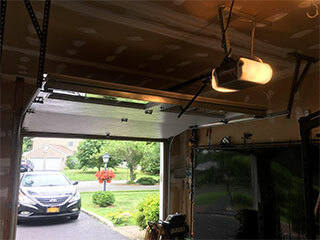 If you're looking to get a new garage door and/or opener installed, our professional technicians will be glad to help. Give us a call and let our experts help you find the perfect model for you.